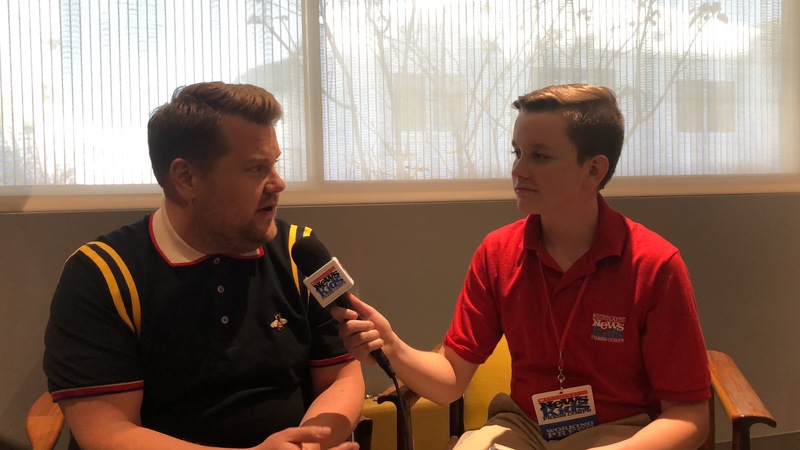 Laughing With James Corden | Kid Reporters' Notebook | Scholastic Inc.
Watch Ryan’s interview with James Corden in Los Angeles. I recently had the chance to sit down with Corden at his office in Los Angeles. The British actor and comedian is host of CBS’s Late Late Show With James Corden, which, he pointed out, airs way past kids’ bedtime. Corden is especially known for a segment called “Carpool Karaoke.” His 2016 performance with British pop star Adele, for example, has been viewed 187 million times on YouTube. Corden created the unique concept for the sketch while living in England, where he grew up. The idea is that he drives around in a car with a musical artist or celebrity, singing, joking, and talking as they travel. He has found the format to be more illuminating than a studio interview. Mariah Carey, Lin-Manuel Miranda, Bruno Mars, Katy Perry, Ed Sheeran, Carrie Underwood, and Paul McCartney are among the artists who have appeared on the segment. Even Michelle Obama took a musical ride with Corden when she was First Lady. “The biggest challenge I have probably faced is people telling me that I maybe don’t look like someone who should be on television or in films,” Corden added. The actor and comedian has used others’ doubts to propel him forward. “Obstacles are only put in your way to be moved, or jumped over, or tunneled underneath, or to go around,” he said. Believing in himself has been a key ingredient to Corden’s remarkable career. “You are completely original, and there’s a reason you are here,” he said. Corden, who is a champion of creative expression, voices characters in such children’s films as Peter Rabbit and Trolls. He has also been cast in an upcoming film adaptation of the musical Cats. “I’m really excited to do it,” said Corden, who has deep theatrical roots. Corden loves reading aloud and bringing stories to life. “Your imagination is probably more powerful than anything you’re ever going to see,” he said. The father of three young children, the actor is concerned about their well-being, especially at school. He encourages kids who are being bullied to reach out to someone they trust. Corden is doing his best to make the world a better—and funnier—place.